I’m really pleased to be able to offer my readers £50pp discount on all Summer 15 and 16 bookings made by 27th July. Just use the code EmmaBlog50. Not valid for free child place and can’t be offered in retrospect. We’ve all returned back to reality with a thud today after a blissful week away at the beautiful Mark Warner Levante Beach Resort in Rhodes. I was a little nervous about returning for a couple of reasons. Sydney, now age 6 was to be in Junior club with her big brother leaving Hannah on her own in Mini club. They’d both been so happy last year in Mini Club together that they were apprehensive about the switch. We needn’t have worried. Hannah and Katie’s Maddie were over the moon to be reunited after a year and settled right back into the familiar surroundings. Sydney immediately made friends in Junior club and was looked after wonderfully by the childcare staff, she had such a good time she asked to go to club in the afternoon as well as morning and couldn’t wait to return in the evening too. Despite the fact that Zak and Sydney spent a lot of time in kids club, we still managed to spend some quality time with them and saw them around and about the resort frequently. It was so lovely to see them chatting with new friends, singing songs, giggling and laughing together. We’ve only used kids clubs on two holidays so far, and both times the children have had a blast. It gives them a bit of independence from us as well which I think is really important. I’ll write more about our holiday later, but for now I just wanted to share some of my favourite holiday moments. I will confess to not being the bravest traveller with children, when they were younger the thought of keeping three small children safe in a different environment was quite daunting for me, it is getting much easier now they’re older, but the added advantage of returning to a familiar environment made the journey SO much easier. We settled right back into our previous routine and it was lovely to see so many of the same staff members around the resort. 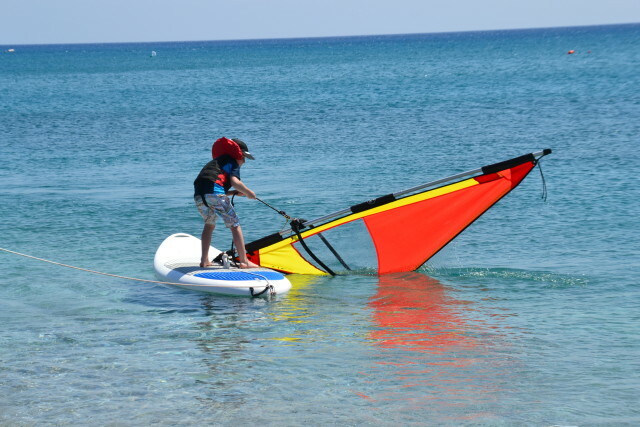 Zak happily returned to Junior Club and made me very proud with his new found windsurfing skills. After a busy morning we had lunch in the pool bar each day. It was lovely to sit and chat with the children, listening to them excitedly telling us about their morning and planning the afternoon ahead. We don’t get much one on one time with any of our children at home, so it was lovely to spend an hour or so each afternoon with Hannah while her big brother and sister were in childcare. We played in the pool, took her out on a kayak and treated her to a special parent and child sail, which she giggled all the way through. One of the things that makes a Mark Warner holiday extra special are the fantastic staff, every member of the waterfront team we spoke to was helpful, attentive and went the extra mile to help us out. In this instance, they patiently allowed Hannah to help push the boat and cheerfully gave her a piggy back over the hot sand to save her little feet getting hot. Hannah loved the extra attention and had a really lovely hour on the beach. Little Sydney surprised us all with her enthusiasm for Junior Club, watching her walk arm in arm with her new friends is a memory I’ll treasure for a long time. 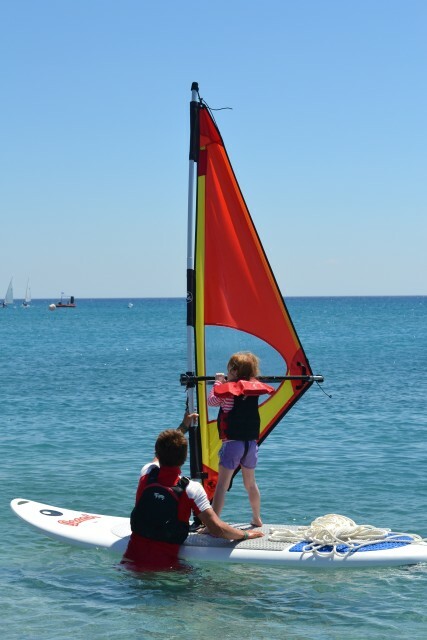 Sydney became quite fond of some of the guys on the waterfront, even nicknaming them Georgina ( George ) and Pom Pom ( Tom ), a big highlight of her kids clubs adventures was the windsurfing and a very exciting sail one particularly windy day. At the end of the week there is a special presentation for the children going home, they sing a song and are each given a certificate and award. 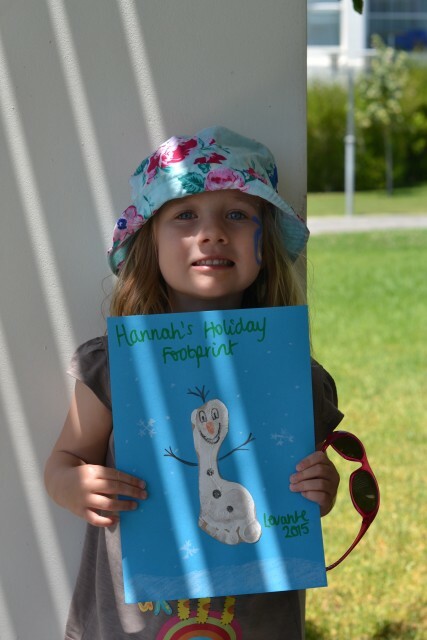 Hannah for the second year in a row got the award for smiling so much, which really sums up her holiday. Lots and lots of big smiles! My own personal favourite moment apart from watching the kids enjoy themselves was lying on a paddle board on the sea with my eyes closed, feeling the ocean rock below me after the sunrise SUP stretch, it was such a peaceful calming experience, I wish every day could start that way. Read our full review of Levante Beach Resort here. I’m really pleased to be able to offer my reader £50pp discount on all Summer 15 and 16 bookings made by 27th July. Just use the code EmmaBlog50. It’s great to hear such positive things about kids clubs. I’ve never used them before but this makes me feel a lot more confident. Wow what fantastic holiday experiences you have had this year. 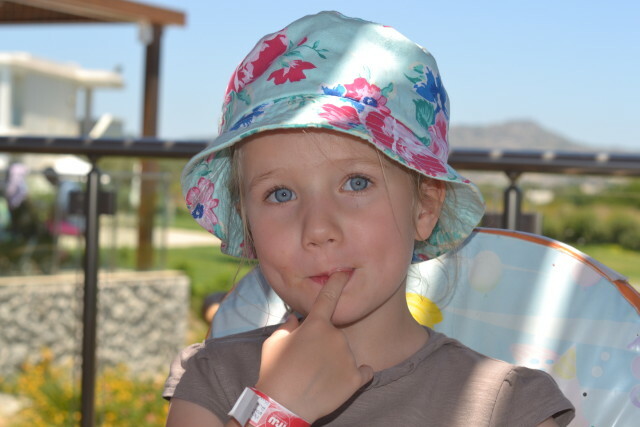 I have read so many brilliant things about Mark Warner holidays and the childcare and activities for children are so amazing, that just makes the holidays even more appealing. Beautiful photos, I am very jealous. oh Emma that looks SO much fun! I have never done one where the kids did clubs…I wonder if they would like it? I am really impressed that there was so many of the same staff in the kids club – that must have been very reassuring. I am glad you had such a great time and hope you can return again soon. Reading more and more about mark Warner holidays has convinced me that travelling abroad with kids might not be a bad idea after all.You look like you had a whale of a time together. Looks like another wonderful trip, but I can also see how much they have all grown, holidays are such markers of that aren’t they? 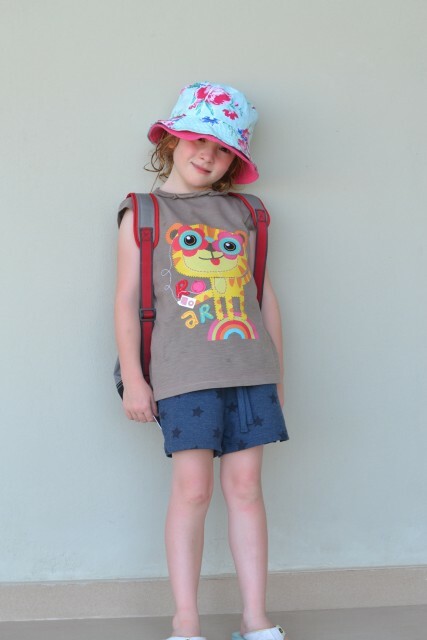 Cass@frugalfamily recently posted..Pipe cleaner crowns…. Anya from Older Single Mum and The Healer recently posted..Our Mark Warner Holiday to San Lucianu, Corsica. 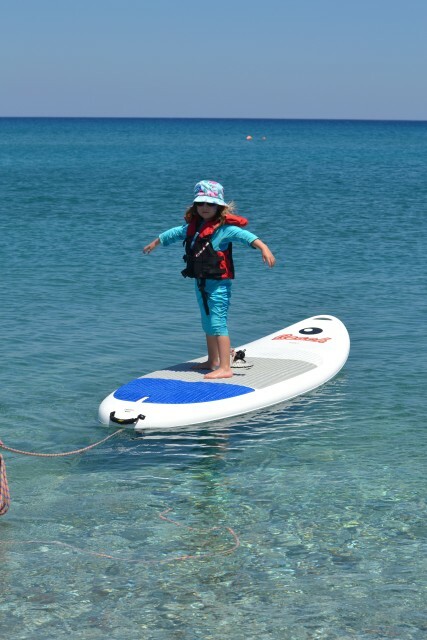 it looks like that holiday is completely suited to you and your family, and they are naturals on the water! Since becoming a single parent, I haven’t traveled abroad with Amy on my own because being the only one to look after her while she’s still fairly young has filled me with dread, but Kids Club looks like such a great option for when you need some time to yourself and recharge your batteries. The kids look so happy and I’ve read so many glowing reviews about the childcare available in Mark Warner Resorts that it’s an option I will definitely look into. We’ve been to Mark Warner in Levante and I wanted to contribute to this conversation because I am a) overweight and b) not very sporty. Thank you for posting about the staff and how great they are, in so much detail – I really want people to go on holiday and try out the activities, knowing that the staff are there to help. I want other people to feel confident that they will be welcomed on them – whether they are new or experienced, fit or unfit. I was literally hauled in and out of the boats – always a good look at size 18 and with a life jacket on!!! Once I got in / off and running it was great to do the activities – even though I was nervous about it. I may even write a blog post “can you be overweight and have fun on a Mark Warner activity holiday” !!!! I now know that Mark Warner are known for their childcare and kids clubs provision, but I think they should also be known for their staff in other areas – they were so kind, patient and laughed with me, not at me, when I was nervous. And that’s something that you can’t put a price on. I think we’ll go back to Levante at some point and can’t wait to see what we try next time! 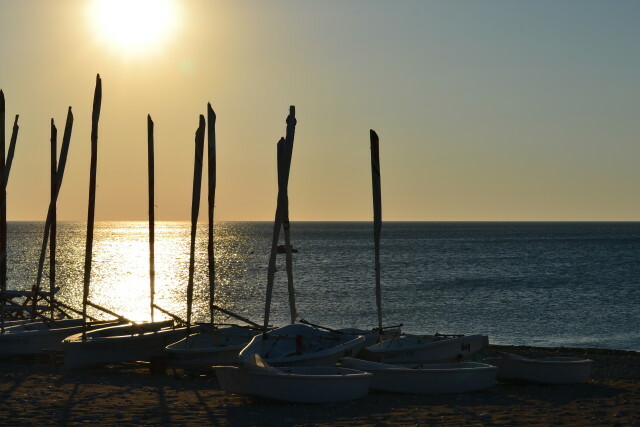 Liz Weston aka @TheLizWeston recently posted..wanna – researching how parents spend money on their babies…..
You’re right about the staff, and Levante always looks like it is brilliant for the watersports. One thing I worry about nowadays with J having diabetes is whether the staff would be able to look after her with that. Do you think they’d cover children with medical conditions? Seems like a wonderful place for a family holidays to relax and practice water sports, love kayaking, wind surfing. I will keep it in mind for my next holidays.